The mighty peak of Mount Cook and the immense Fox Glacier are two of the most spectacular natural wonders on New Zealand’s South Island. On this tour, enjoy dramatic aerial views of both as you soar overhead on a helicopter. 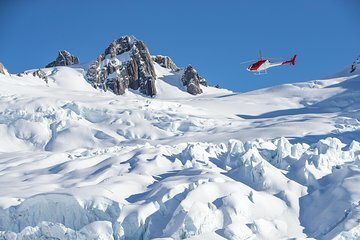 This 30-minute flight travels the entire length of the Fox Glacier, swoops through the Southern Alps and around the west face of Mt Cook, and includes an unforgettable snow landing.